The ducks have grown quite a bit in the last week. They learn very fast! Today we found and gave them some rolly polly bugs. At first they were skeptical, but after a minute or two one of them mustered up enough courage to gobble one down. First bug snack! Then the gossip began and they were all searching for these yummy living (and moving) snacks. Today was also their first bath in a shallow pan of water. Good times. It wasn’t quite enough water for them to float around in properly but it was enough to get everyone really amped. Tomorrow we’re gonna use a deeper pan and see how they handle it. My buddy Wes found a kiddy pool in an ally by a dumpster for their pond. Upcycle. Once it warms up I’ll set up a little fenced area for them to play in. 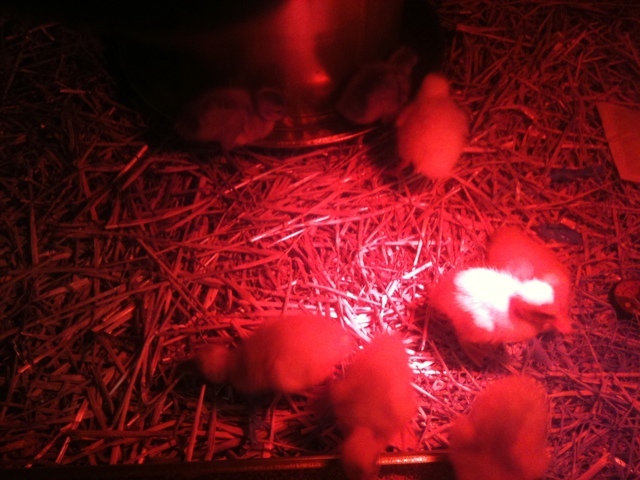 I think its still to cool to let them too far away from the heat lamp. They don’t have their feathers yet, just fuzz. According to Dave Holderread in his article Raising Ducks, ducks are better layers than chickens! Not only do they lay more but the eggs are usually bigger (around 5 -8 ounces more per dozen) AND they keep longer in storage than chicken eggs. It is also true that a full grown duck does consume 20-30 percent more than a full grown chicken, but the duck is a better forager and can get a lot of its food free range in the yard. Ducks are also much hardier than chickens and can withstand cooler climates. 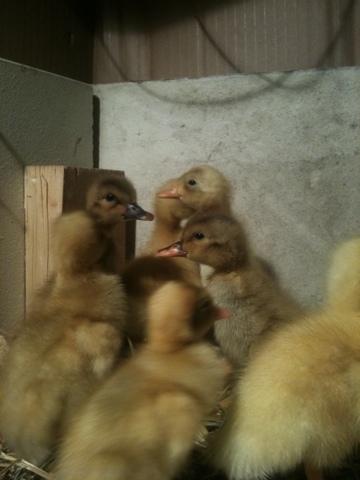 Our ducks finally came! 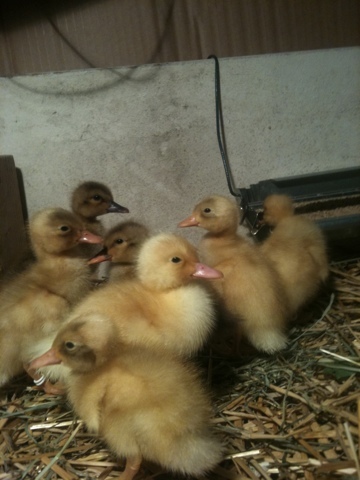 We’d been waiting all Winter to start raising ducks, so this is exciting stuff. We ordered 7 and they sent us 8. Bonus duck! Clearly a sign from the duck gods that we need more than a mere 7. Post office called early Weds morning, informed us our ducks had arrived, we rushed giddily to pick them up. When we walked into the main room of the post office we could hear their little chirps! It was like Christmas morning. They came in a little cardboard box (with air holes in it) that weighed practically nothing. They all arrived safe and sound and REALLY hungry. 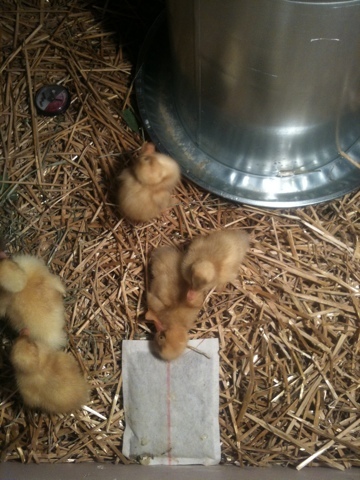 I ran to the feed store and got chick feed and their waterer. Decided on the big waterer because they grow fast and I don’t wanna have to buy a bigger one later or have to fill up their water more than once a day. A few years ago I got the book Four Season Harvest by Elliot Coleman. Among many other gardening methods the book has inspired, the chapter on how ducks are wonderful garden helpers sparked my interest in raising ducks. They can be fed on kitchen scraps and they eat garden pests. And they are full of lively entertainment! Duck eggs are more nutritiously dense than chicken eggs and ducks are prolific layers. I’ve done quite a bit of research on the cyber web, and one place with useful step by step info is at the New Agrarian. 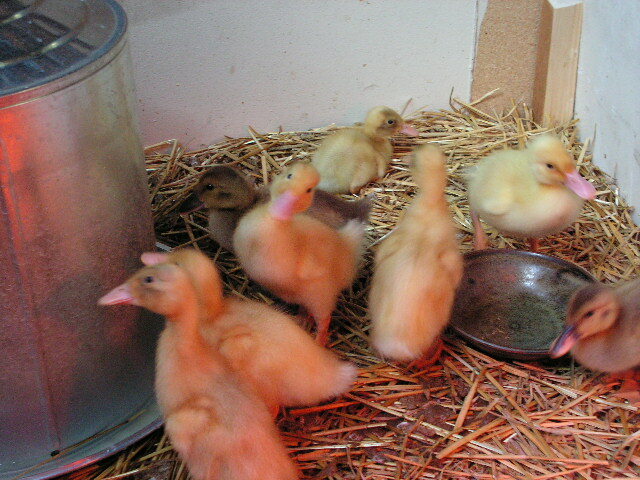 This is a great blog for info on raising ducks for the first time. 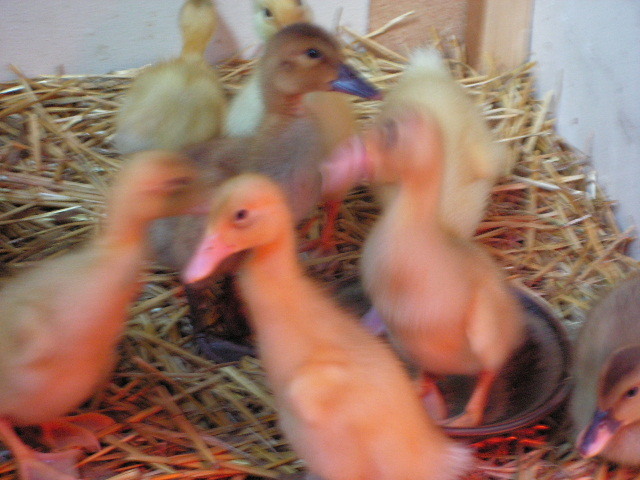 We ordered the ducks from Metzer Farms. I heard good things about them online and they have a great reputation for treating their animals humanely. Their prices seemed competitive also. They had a large selection of duck breeds as well as geese, guineas, turkeys, and pheasants. We ordered 3 Indian runners, 2 Hybrid 300 layers, and 2 white layers, and we got a BONUS (mystery) duck, which we think is another Indian runner. The Hybrid and white layers are bred to lay over 300 eggs a year. That’s almost an egg a day per duck! I built a little 4′ by4′ brooder out of scrap wood. 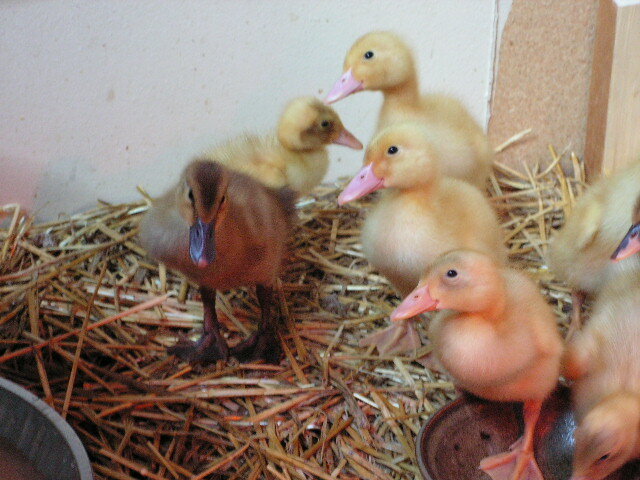 A brooder is just a pen where the ducklings can stay safe, warm and contained when they are small. A heat lamp is clipped to the side of their pen which keeps the temperature at about 90•F. The bottom is layered with straw. The brooder is locked in the garage/glass studio/beer brewery station #1 — to keep them safe from the Caballero, our indoor/outdoor cat.